Several years ago, I decided to start publishing a real estate newsletter with the intent of providing the type of information that above all else would help buyers and sellers strengthen their positions in negotiations. Over the years, we have seen our subscriptions grow to nearly 5,000 people, and the numbers are climbing steadily. In fact, more than half of the subscribers are real estate professionals from around the US, and I often get questions about how the Tallahassee Real Estate Newsletter is made. There are many boiler-plate newsletters that people can buy to send to their clients. They are mostly filled with "verbal vomit" and they have nearly zero value to people looking to buy a home or sell a home. I wanted something different. Joe - I'm interested in learning how you put together your online newsletter. Is it a compilation of some of your most-viewed posts? What software/app/plugin do you use to put the newsletter together?" This is the type of question that I was asking others in 2007, hoping to find a "good" product to buy and send. Unfortunately, everything I found was just well-dressed spam. They were loaded with cheesecake recipes and boring articles with titles like "The 217 things all sellers must know ... ", the sort of stuff designed to "generate leads" from the masses. That was just not for me. I decided to start using my market analysis that I was conducting each day for the real estate agents and customers of my company and publish the content. At first, I was publishing a daily blog, and most of the articles were written with a focus on the needs of homebuyers and/or home sellers. But as time grew, I knew I needed something a little more in-depth, so I created the Tallahassee Real Estate Newsletter. It is e-mailed on the 3rd Monday of every month, with a one-page supplement (The Weekly Special) on all the other Mondays. I only use three tools to create and deliver the Tallahassee Real Estate Newsletter. I use Microsoft Excel to organize my data, I use Microsoft Publisher to organize it as a newsletter, and I use Aweber to manage a double-opt-in mailing list and distribute the newsletter. Microsoft Excel - What a robust program. I simply set-up spreadsheets full of real estate market data, and then use the simple charting features of Excel to produce the hundreds of different charts and graphs that are featured each week in our newsletters. I can't think of a more valuable tool for somebody wanting to extract and present information about a local real estate market. Microsoft Publisher - Another great tool from Microsoft, Publisher is used to create the newsletter format so that all I have to do is type and publish. Aweber - I felt it critical to make sure that I was never perceived as a "spammer." In order to receive the Tallahassee Real Estate Newsletter, people must sign up (like in the form above), and then they must confirm that they have signed up when they receive an email. This "double" confirmation ensures that the newsletter is only sent to people who want it, and every mailing includes a link that allows them to un-subscribe ... they can remove themselves from the list any time they like. 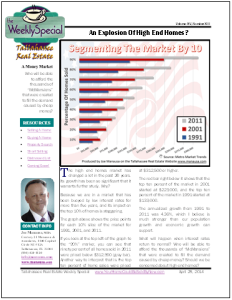 Who Should Read The Tallahassee Real Estate Newsletter? I might be a bit biased ... but anybody who has a stake in the Tallahassee real estate market would be crazy not to subscribe to our free service. You will get a mailing every Monday, and once a month the report expands from one-page to typically nine pages of information. If you are too busy to read it, you simply delete the email and wait for the next one to arrive. No muss, no fuss. If you are a real estate professional elsewhere in the US, I suspect you will learn a lot from my analytical view of the Tallahassee housing market. You can gain ideas for your own client interactions, and you can also discover new modelling techniques to apply to your own local market. As much of the information we receive from NAR is biased, a study of our newsletter just might teach you the critical skills to properly assess the current state of your own market. I am a firm believer that knowledge is power, and I believe on providing this service to anybody who would like it. I figure many people will still work with their favorite real estate professional in Tallahassee, but enough will see some benefits of working with a market-savvy agent and we'll be able to justify all the work that goes into the Tallahassee Real Estate Newsletter. 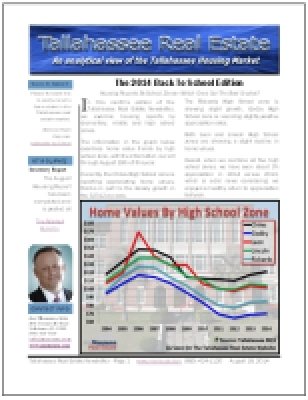 So whether you subscribe to the Tallahassee Real Estate Newsletter to learn more about Tallahassee housing, or simply subscribe to learn more about real estate market analysis, we hope that you will read our work and provide feedback from time to time to ensure that we continue to deliver what our readership appreciates.